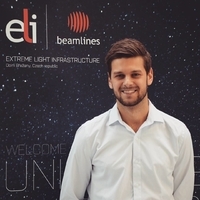 Petr Valenta is a PhD student in the field of computational physics at the Faculty of Nuclear Sciences and Physical Engineering, Czech Technical University in Prague and a researcher at the ELI Beamlines laser facility, Institute of Physics, Czech Academy of Sciences. He is dealing with the interaction of high-intensity electromagnetic waves with plasmas, non-linear wave theory and high-energy photon generation. He is studying these topics mainly through large-scale numerical simulations.